There are a lot of natural supplements that can help optimize the body’s ability to fight infection and even its cognitive ability. Over centuries, traditional medicine used mushrooms in order to boost the body’s ability to heal and recuperate. But what makes mushrooms so intriguing is the fact that there are mushrooms that have been proven by studies and have been applied in today’s world. If you haven’t heard of lion’s mane mushroom, it is the time that you pay close attention to this one of a kind fungus supplement. What exactly makes this supplement unique? What are the benefits that you can get from lion’s mane mushroom? Otherwise known as Hericium erinaceus, lion’s mane mushroom has been used for centuries in traditional Chinese medicine. It has been used mainly to help stomach ailments and even to fight cancer. It is found in parts of Japan, North America, Europe, and China. Mostly, the mushroom is found on dead trees. Aside from the name lion’s mushroom, it is also known as sheep’s head, bear’s head, and yamabushitake. In the past, this mushroom has been used mainly for dishes served to royal families. What makes this mushroom special is that it can actually taste like shrimp or lobster. There are a good number of benefits that this mushroom can do to the body. In fact, let’s first start with what it can do to the brain. Based on a study, lion’s mane mushroom has the ability to help elderly patients improve their cognitive function. It has also been known to help patients dealing with dementia. In a study made on animals, it has been able to increase the level of acetylcholine which is a neurotransmitter that usually decreases when a person is suffering Alzheimer’s disease. Acetylcholine also drops as a person ages. So what makes this mushroom such a great option if you want to optimize your brain’s health? In another study, it has been noticed that lion’s mane mushroom enhances the growth of neurons on animals. This means that it has potential to be used for neurogenesis. As for those who are suffering from anxiety and depression, it is also possible that lion’s mane can help you with your condition. It contains amycenone which is considered as an effective antidepressant at least when it was tested on mice. Some experts also believe that the ability of lion’s mane mushroom to decrease inflammation is the one responsible for helping individuals decrease their signs of depression. And aside from helping individuals with their anxiety, lion’s mane mushroom is also known for helping alleviate sleep problems. What you have to understand is that lion’s mane mushroom is more than just a supplement that you can use in order to promote your brain’s overall health. It can also be used to help the body fight infection. What it does is help increase your immune response by activating macrophages and NK cells. There are even studies that suggest lion’s mane mushroom to have anti-cancer properties. What it does is activate the Th1 response that can help fight against tumors. It also helps inhibit blood flow going to cancer cells helping stop the spread of tumor cells to other parts of the body. It is important to take a closer look at lion’s mane mushroom as a supplement. What it does is help the body improve its overall health. It can even potentially help you prevent cancer. The good thing about this supplement is that it is all natural. It has also been used for centuries. And now, we have enough studies to prove its effectiveness. It is a good idea to make lion’s mane mushroom as part of your daily supplements. Most people who are traveling around the world do so for a very specific reason. Either they are trying to do so for business purposes or they are vacationing, but whatever the case may be, they are getting their entire routine messed up. Many people don’t even realize that the simple act of flying can be unhealthy for your entire brain and body, which can cause significant side effects. Some people have issues with their weight when they travel (for a host of reasons), but then there are other issues that can come into play as well. The best way to stay healthy on a plane while you are traveling is to simply not eat at all. This will be the easiest way to get into a ketotic state (ketosis), which is also known as banting in some parts of the world. When you are on a banting diet, you’ll find that you have far more energy with less food. The reason less food is good is because of the negative food options you have while you are working on the road. It is nearly impossible to stay healthy and one of the best ways is to avoid everything altogether. Even if it seems like a bad choice in some ways, it’s actually far better when you consider everything together. If you find that banting diets are difficult it is because you do not have the right banting recipes! There are literally hundreds of delicious ways to stick to a banting diet while you are on the road. Most of them include copious amounts of fat (such as coconut oil), which is actually quite healthy for you in the long run. One of the greatest things that you can do is fasting in order to get into a nutritional state of ketosis. This will help the banting diet because you will have chemicals produced in your brain and body called ketones. These ketones are going to be your fuel source for your brain if you are not eating a lot of carbohydrates and this is going to be great for the long-term. Most people who use banting diets find a tremendous host of benefits as a result. From the western world, try to consider the furthest point on the opposite side of the globe. For many in the west, the furthest point is Dubai in the United Arab Emirates. This location is one of the longest, which means it has the most changed time zones, a healthy dose of jet lag, and few options to avoid this. Of course, for anyone who is trying to avoid long hauls and the sickness that comes with it, there are a few health tricks that we have up our sleeve. 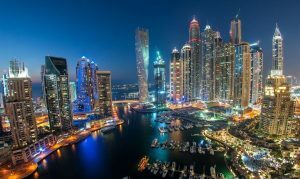 Instead of succumbing to the jet lag and health problems, we are going to give you the solutions so that you can enjoy your Dubai holiday and get back to what is most important for you. Of course, the primary concern of Flight Health is to make sure that you remain healthy while you are traveling and if we didn’t touch on jet lag on the longest duration flight away from the western world, we wouldn’t be doing an adequate job! Melatonin is going to be your friend if you are trying to maintain an adequate level of health while you are flying abroad. Most people who fly long distances do not realize that the reason they have jet lag is because their circadian rhythm has not caught up to them. This means not only that you have a hard time staying away (or falling asleep), but you also could have downstream negative effects. Some people take activated charcoal when they visit long-distance places like Dubai so that they can improve their gut biome and prevent any long-term damage. The activated charcoal soaks up the toxins and this can be very useful. One of the things you cannot control is how good your sleep quality is when on a plane. Often this is because of the issues that come with long-distance travel. You can do a few things to get adequate rest. For one, do not take any kind of sleeping pill. This might help you to sleep in the short-term, but is not a good long-term option. Also, it is a good idea for you to consider having some kind of carbohydrates in the evening so that you can have the brain chemistry that is conducive for sleeping. You can also bring herbal remedies like lemon balm and similar natural options, but it is even more important when you are headed across the world to Dubai! There has been a lot of talk in the news about the TSA and their impact on how Americans (and others) travel in the United States. Much of it revolves around mis-trust that people have for a private company that is not subject to the rigors of the law as other agencies. More importantly, a number of incidents have come to light that have scared even the most conservative of people. TSA is not inherently bad, but the stress that it often causes us can be seen as a poor influence on our general health. In the following article, we are going to discuss how the TSA has eroded our health and what you can do about it. For one thing, the TSA has added strain and anxiety to the airport process. It isn’t just psychological or emotional strain that comes from the scrutiny of our bags, but also the physical strain of X-rays that provide an accumulation of radiation for our bodies. This is the first hardship that TSA has caused even if it isn’t something that could cause a lot of harm. Otherwise, the practice of traveling is stressful enough as it is. If you have people groping you and potentially touching you in inappropriate ways, things get even worse. If this happens while engaging with TSA, you might want to call Warriors for Justice or a similar legal entity that can help to support your claim and fight back. Not every single TSA agent (and in fact most) is going to be problematic. There are few bad apples, but sometimes they sour the bucket for everyone else. It is important for you to stay vigilant and just make sure that you are being held with respect while you are traveling. You do not need any extra stress during already stressful times. When it comes to traveling, it always seems like things are a little more stressful than you’d like. Some people experience feelings of stress and anxiety, which create illness and discomfort. Among the worst issues is called jetlag, which can neither be avoided nor prevented. However, there are changes that happen within the brain that can cause significant effects for your overall health. One of the most common problems that people face when traveling is brain related issues. As we have mentioned, jet lag is a major issue that can cause problems for people who are struggling to stay within their right circadian rhythm. Anyone who is taking nootropics can utilize certain smart drug options to make the experience better. For example, bacopa monnieri is a nootropic that can help you to relax and reduce your feelings of stress and anxiety. While nootropics are not new, there are only a few different unique blends that really work. You can look for something like OptiMind, which is a nootropic that has general enhancement properties. One of the best OptiMind reviews show that there are plenty of benefits and not many risks even if the drug is relatively expensive. Whether or not you are trying to improve the quality of your life, it is important for you to keep in mind what is happening with your travel. Jetlag is obviously the first issue to keep in mind and it can be remedied by using a nootropic called melatonin. When you are using melatonin, you are able to get a much better perspective on things that make a big difference for you in the long run. Melatonin is a good idea for people struggling with jet lag and so is activated charcoal. If you are using activated charcoal, it is a lot easier to overcome the side effects that come with jet lag for your digestive tract. Sometimes with travel being disrupted, it is possible for you to have issues with your stomach and intestinal tract. By using the activated charcoal you can avoid all this. Another problem with travel that you must consider is the changes in altitude. Sometimes the dry cabin air (from flying) and the changes in altitude mean that oxygen isn’t getting to your brain in the same way as you might like or desire. For you to get this in a better way there are several nootropics like aniracetam and piracetam, which are effective for the purposes of enhancing your oxygen in the brain. Finally, if you are trying to avoid having any kind of travel related problems when you are getting on the plane, it is a good idea to take some preventative measures. Take upwards of 2000 mg of vitamin C and you are going to help bolster your immune system. By improving the strength of your immune system you can make sure that you are able to avoid ill-health and the sick days that come with it! As you can see, it isn’t very difficult to overcome the difficulties of travel if you have the right mind for it. There are several different ways that people have found can work in order to enhance the quality of your overall experience without making you spend too much time or money on the effort. A lot of people make the mistake of thinking it has to be a whole operation and procedure just to protect yourself and this simply isn’t the case! With these changes, you can actually avoid many of the symptoms of air travel even if you cannot do it fully because of the impact on the body. When it comes to maintaining good health while flying from destination to destination, it makes sense for you to spend time sleeping. If you can’t do anything else (especially when there is no access to internet), then it means you really need to focus your efforts on sleeping while you have the chance. When you are on an airplane, this can be difficult. You aren’t in a comfortable position, often people around you are making noise, and it is generally just a poor environment for sleep. However, there are some things that you can do in order to make sure you get adequate sleep while you are on the plane. In the following article, we are going to give you a few suggestions. There are a few things that you have to get done if you want to make sure you are staying as healthy as you can. The vast majority of people who are sleeping in a flight situation find that it is nearly impossible without the following tools. Lemon balm – another natural herb from the Mediterranean, this is a good option for people who want to relax. There is no need to make tea while you are on a plane (as it is a bit impractical), but perhaps you can use the lemon balm extract for better sleep. This is always a huge advantage for people who are trying to get a good night of sleep while they are flying around the world. Meditation – if you have a practice of meditation, it’s going to help a lot. The meditative state is one where you are consciously taking control of your breath and maintaining the right kind of mental brain waves. This is often considered an “alpha brain wave” state which helps with creativity, but also going to sleep. Melatonin – this is a hormone that your body already produces in order to help regulate the light / dark cycles. Unfortunately, melatonin can sometimes get hijacked and that leads to some serious problems for you. The most important thing you can do with melatonin is not abuse it. The more sparing you are with it, the more effective it is going to be for you in the long run. The vast majority of people who are taking this kind of drug find that they are able to get much better sleep when they use it as a tool and do not abuse it. Like anything else, all of these items are great tools when they are used in moderation and with care. Most of them are natural ways that you can boost your sleep abilities especially while you are in the air, but it is important that you pay attention to the doses and never take things that are going to cause you to have problems in the future. The vast majority of people who are utilizing these kinds of drugs don’t realize that they come with a certain responsibility. It is imperative that you have the wherewithal to realize this before you go too deeply down that rabbit hole. You might find that it is a lot better for you to have this kind of a situation than you would have otherwise expected. Traveling can take a lot out of you, but in reality it is what traveling does to your diet that can often be the worst. Most people who are trying to improve their health forget that they need to get all the nutrients that are essential for them through other means than food. Most of the time, the food that is available either in the airport or on the plane is of low quality and not really worth much. It is therefore an important thing for people who fly often to get as much support as they can for the types of things that they are doing. The nutrients that we are going to cover in the following article are going to hopefully make a big difference in your life and help you to overcome many of the negative side effects of deficiencies. Iron – this is a nutrient that most people do not get enough of when they are flying. Usually iron comes in red meat, which is not as easy to eat at expensive airport restaurants. If you are trying to get more iron in your diet, it might be a good idea to use some cacao powder. This is going to help you to get the best results without going through too much extra work. Magnesium – another good nutrient, magnesium is essential and hard to come by if you sweat a lot. One great way to get more magnesium in your diet is also to use cacao powder, but almonds are even more effective. Most people do not realize that almonds have so much magnesium, but be careful as too much of this nutrient can hurt! Vitamin D – even though you might feel like you are “out” of the house, the reality is that on airplanes and in airports, you aren’t getting enough sunlight or vitamin D. If you can step outside in between connecting flights or just take a supplement, you will be in a lot better shape. A lot of people consider the hardest part of travel to be the jet lag and sleep deprivation. Primarily, this occurs even when the flight isn’t long or the travel far. The reason for this is because of how difficult travel is on the body. It can take months for the body to recover from a move to a new city or country and even if you travel a short distance, your body has to adapt to this. For the most part, people who are sleep deprived have lesser cognitive function and aren’t able to maintain their intelligence. People who are high performers, such as doctors, lawyers, and military personnel, are unable to operate under these conditions because it is a matter of life and death. Most people don’t realize that the #1 tool to get rid of sleep deprivation isn’t technically a a nootropic at all: it’s water. In the articles to come on Flight Health, we will have plenty of information about nootropic drugs and other things that you can use to improve your health while in the air. However, for now we are going to focus on something basic. Water is 70-80% of our body by weight and a huge part of our cognitive function is dependent upon our ability to drink enough water. For most people who are trying to do a lot during the day (and especially traveling) it is hard to get enough water. As you can see, jet lag is a major burden for people, but it isn’t the only thing to keep in mind. Drinking enough water is as important as getting nootropic drugs that will help you to overcome the effects of sleep deprivation. How do you get enough water? Simple. Make sure that you drink a lot of water before you even get to the airport. If you can get your quota beforehand, you’ll be in luck. If you don’t want to go that far, drink as much as you can and buy the rest after airport security. No matter what you are going to be peeing a lot, but that is okay. You can urinate frequently and still see plenty of benefits by drinking enough water. This video is an excellent explanation of why you need to put your oxygen mask on first if there is cabin depressurization because of the debilitating effects of hypoxia (lack of oxygen to the brain). After seeing this video, we knew we had to share it with our readers that are interested in Flight Health and Safety. Stress is a common problem when flying. Given the physical and psychological strain of flying, it is unsurprising that there are many people who feel stress for at least a period of the whole process of flying. Rushing to the airport through traffic, finding a parking space, negotiating luggage, finding your terminal and that’s all before the delays, cramped conditions, lack of sleep, oxygen deficiency and dehydration. There are many factors which will contribute to a stressful flight. For many these can lead to air rage as a number of these factors overpower the individual to react aggressively. Those with a fear of flying, will inevitably experience further anxiety, given the psychological barriers they will have to confront. Medically speaking, irrespective of whether the stress is a product of aggression or anxiety, stress is the product of an increase in adrenaline and noradrenaline into the blood stream. Noradrenaline is produced in anxiety situations, whereas adrenaline is a means for our body to deal with aggressive situations. If you are to deal with stress when travelling, then it is vital that you are able to reign control over the situation, by reducing the level of stress hormones in the body. This is particularly important, if you are often prone to fits of air rage, for the safety of both your fellow passengers and the air cabin crew. Ensure that you get a decent night’s sleep before flying, as tiredness can compound stress. Planning ahead can help avoid many situations which contribute to a stressful journey. Make a note of the connection times for each leg of your journey, i.e. time of flight, time you need to check in (remember this is 2hrs or more prior to flight time for international departures), time you need to leave your house and so on. Very few people actually work out how long all the legs of their trip will take, leading to a last minute dash, which can only induce stress. Always leave plenty of time to complete each leg of your journey. Remembering that you will be weighed down with luggage, and that airports are usually large crowded places with a number of stop points (luggage check-in ,immigration etc.) it is vital that you provide additional time to accommodate these possible obstacles. When waiting at the airport, try to relax your mind by reading a book or magazine, rather than getting wrapped up in any delays or crowds, which may begin to cause nervous energy released as stress. Dissipate excess energy by taking a brisk walk on the morning of the flight, and whilst at the airport prior to flying. Avoid alcohol as this will only disorientate and tire you further. Drink plenty of water the night before and during the day of flying to avoid dehydration, you can also take a natural supplement such as Ashwagandha, that is known to help combat stress and anxiety. Take advantage of in-flight entertainment to distract your mind throughout the journey by listening to in-flight music or watching in-flight movies. Fear of flying effects a number of people, the very idea of flying invoking severe anxiety. Fear of flying or aero phobia is a fairly common phobia, which can be experienced to differing extents. It is, however, one of the few phobias which can reoccur after treatment. Fear of heights, compounded by flying at altitude. Fear of lost control. Namely a panic related attack, whereby the individual is unable to vacate the confines of the airplane if she has a heart attack or other medical condition. Claustrophobia, in which the person feels trapped and fears suffocation. Take a course or read educational material to manage your fear, most airlines run courses for fearful flyers. The medical profession provides psychotherapy through chartered clinical psychologists (UK) and cognitive behavioural therapists (US). Stress therapy such as transcendental meditation is a useful alternative to clinical intervention. Confronting the fear directly. This method, based on behavioural concepts such as desensitization, is practiced by many airlines. The fear is gradually overcome through repeated confrontation of the object or situation. Those who like to feel more in control of the situation may benefit from trying out a simulator in which they can experience ‘ piloting ‘ an aircraft for themselves. “Air rage” (or sky rage) is the new label for extreme misbehavior by passengers on aircrafts. Frequently covered in the world’s media, cases of air rage and misconduct appear to be happening more and more. In reality, incidences of air rage are no more common than 20yrs ago, only now there is a heightened awareness within the industry to report such cases. Combined with a growth in the industry as a whole, the problem appears to be more acute, given that there is a now more of a concerted effort to recognize and deal with the problem. Air rage is the product of several factors, which unfortunately occasionally collide. Reasons may include excessive alcohol consumption combined with a feeling of helplessness, both within the cabin and through being exposed to long delays, as well as general psychological feelings of lost control due to the stress and anxiety certain people feel when flying. Many of these cases can be linked to aerophobia or ‘fear of flying’. The Civil Aviation Authority CAA, is trying to compile a database of incidents to assess the extent and reasoning behind air rage, ultimately to delineate possible solutions. Surprisingly, alcohol is not the main cause of air rage, with drunkenness only accounting for 25% of all incidents. Instead anxiety through delays, cramped conditions and restrictions such as banned smoking are the leading causes. To avoid air rage during a flight, it is vital to relax. Tiredness is a major constituent of stress and rash, irrational actions. By ensuring that you get plenty of sleep on the night prior to flying, will automatically ensure that you are relaxed and less likely to be irritable. If delays occur, take it with a pinch of salt, and avoid getting ‘caught-up’ in the situation. If you have to be back by a certain time or date, discuss with your airline alternate flights and routes available to you. Phone ahead and explain that you will be delayed. In short, deal with the problem rather than allowing the problem deal with you. If you are delayed, accept it as a given. Shouting and violence will make not get you to your destination any faster. Go for a short walk, or read a magazine or newspaper. Don’t dwell on the situation, as this will only intensify your feelings of anxiety and stress. If you do like to drink during a flight, be aware that every drink at altitude will have twice the effect at ground level, so drink moderately interspersed regularly with plenty of water.